During your opponent's Main Phase (Quick Effect): You can send this card from your hand to the GY, then target 1 Effect Monster your opponent controls; that face-up monster your opponent controls has its effects negated until the end of this turn. 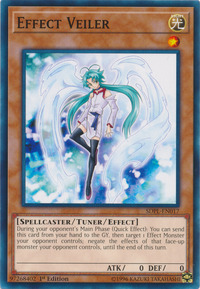 This card has a counterpart, Extra Veiler, which is used by Jack, while this card is used by Yusei. This monster's wings give it a slight resemblance to an angel. This monster bears resemblance Ren from the series DearS. If you control the targeted monster when the effect of "Effect Veiler" resolves, the targeted monster's effect(s) will not be negated. If the targeted monster is no longer face-up on the field when "Effect Veiler"s effect resolves, the targeted monster's effect(s) will not be negated. If the effect of "Effect Veiler" resolves, and the targeted monster is then flipped face-down, its effect(s) will no longer be negated, even if it is flipped face-up again later that turn. If it is your opponent's Main Phase and you activate the effect of "Effect Veiler" negating the effect of "Fossil Dyna Pachycephalo", you can then activate cards like "Call of the Haunted" to Special Summon a monster. The effect of "Effect Veiler" cannot negate effects which activate in the Graveyard. Suppose that "Exiled Force" is affected by the effect of "Effect Veiler". If "Exiled Force" Tributes itself to activate its effect, then its effect is negated. : If you activate the effect of a "Exiled Force" which is affected by the effect of "Effect Veiler", then is it negated? When resolving the effect of "Effect Veiler", if the targeted monster is face-down, then do not apply the effect of "Effect Veiler" and do not negate the targeted monster's effect. : When resolving the effect of "Effect Veiler", if the targeted monster is face-down, then do you negate its effects? Example: "Trishula, Dragon of the Ice Barrier" activates its effect, and "Effect Veiler" is Chained and targets "Trishula, Dragon of the Ice Barrier", and then "Book of Moon" is Chained also targeting "Trishula, Dragon of the Ice Barrier". Resolving backwards, "Trishula, Dragon of the Ice Barrier" is flipped face-down, so that "Effect Veiler" cannot negate its effect.